1. Click on the Add Task icon to create a Task within a Story. 2. While creating a task, add a task name, assign the team member and estimate the task duration in order to start working on it. Tasks can also be added using Add with Details, where the one is allowed to create a task in detail view. Add with details provides a same view of a task as it’s available in Edit Task. 1. Click on Add with Details link on quick add view. 2. On click, full add view will appear. 3. Give name to the task and click on Save. (Only after you give name and click on create, you can add other details within a task). The task name will help you to refer a tasks easily. You can give relevant name to the tasks, for e.g. if you have to develop reviewing the code you can give task name as Code Review. Prioritize your tasks according to its importance such as: High, Medium or Low. You can write the brief description of a task in the description field that will explain task in a better way and will help all team members to understand intention of the task clearly. The one to whom the task has been assigned the task can estimate the duration of that task’s completion. It improvises the prediction rate of an assignee whether the estimated duration matches with its completed duration or not. Remaining Hours elaborates the amount work is remaining in a task which also reveals the total amount of work is completed. Select the status of the task i.e. In Progress. 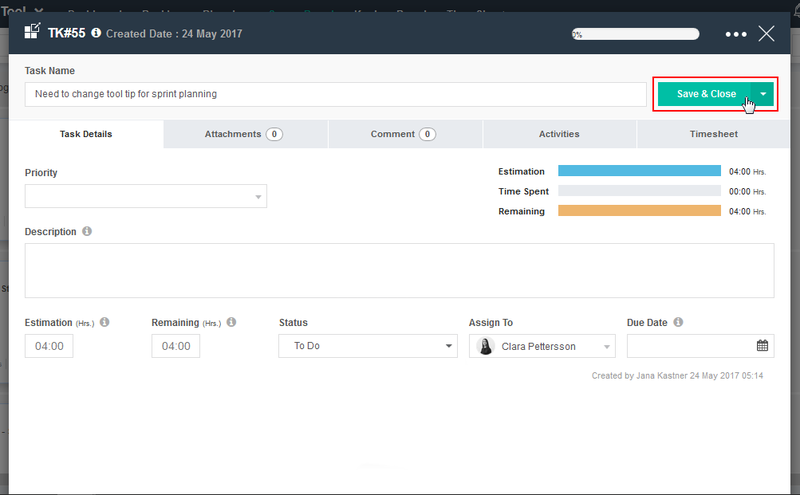 Quickscrum also customizes the task status from Taskboard Configuration. The one who is responsible to work on the task. Due Date shows the date of tasks completion.